Free Eye Screening Camp organised by Wancho Students Union at Kanubari, Longding. 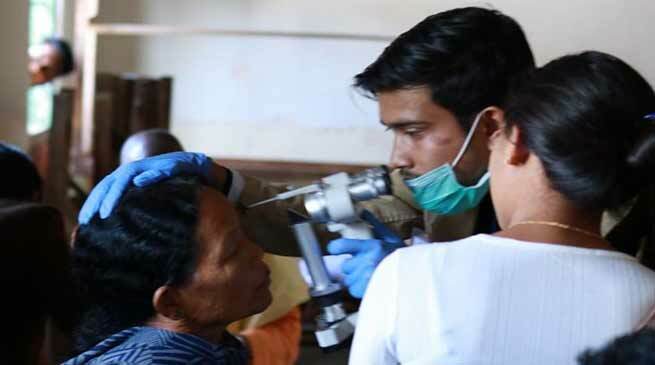 Hundreds of students and public get benefited from Free Eye Screening Camp being organised by Wancho Students Union in collaboration with Ramakrishna Mission Hospital, Itanagar at Kanubari, Longding district today. MLA kanubari- Gabriel D Wangsu inaugurated the free eye screening camp in presence of Additional Deputy Commissioner, Kanubari T Mize, Swami Divakarananda Maharaj, Narottam Nagar, Ramakrishna Mission, Deomali and others. Addressing the gathering, Wangsu appreciated the Wancho students Union(WSU) for such initiatives. Such event is really helpful for the students and public who have eye problems and even cannot afford to go outside the village or their town. He also extended his gratitude to all the medical team for coming to Kanubari and conferring free eye screenings. Further, MLA also appealed the villagers and students to take proper care of their eyes. Elaborating about the Free Eye Screening Camp, President WSU, Pongnoi Joham informed that, with concern about the students and their health specially on their eyes we have organised the camp, so that they could get at least minimum care about their eyes and its related diseases. He also added that camp is not only limited to students but for the villagers also who cannot afford to go outside the town or state for eyes related problems. WSU President also informed that similar camp will be held at Longding and Pongchao on November 14 and 15 next. Besides, free eye screenings we are also distributing eyeglasses to the needy people and also extending support for the operation, he added. Meanwhile, he also extended his gratitude to the Chief Minister, Pema Khandu, Minister of Education, Honchun Ngandam, MLA 59th Longding constituency- Thangwang Wangham, MLA 58th Kanubari constituency- Gabriel D. Wangsu for supporting the event. Among others, Indian Army official, Teaching staff, PRI Member, Chiefs from various villages and HoDs attended the inaugural event.